BtoC brands have already reached a maturity stage while BtoB brands remain in a fast-growing stage, both in terms of marketing & brand manager positions and in terms of allocated budgets for brand promotion. Consequently, one of the main goals of this book is to provide companies, schools and universities support to better promote their brands. Many organizations are subcontractors depending on their ability to win request for proposals. Without a brand strategy, the candidate company stays invisible in the value chain: no name, no gain! The challenge for organizations is to win the "battle for visibility" in order to put an end to their anonymity status (simple technical partner). From then on, they have to create value through a fitted professional branding policy. BtoB:the target is the client organization and it is impossible to precisely identify the individual beneficiariesBtoBtoC: the brand addresses the client' consumers of the final products (manufactured by the client organization). This approach is characterized by the strong prescription role of the client company's marketing department and can be part of a vertical co-branding.BtoBtoE: the final customers of the brand are the employees of the public or private client organization. The goods and services are sold to the latter but are meant for the company's employees use. In this approach the Human Resources department can have a prescription role.BtoAtoU:The brand does not target a consumer but a user (sometimes called road-user in public transportations). Lobbying techniques are particularly effective in this case. In 10 chapters the characteristics of B to B are dealt with (Chapter 1) particularly those related with the purchase decision process (Chapter 2) and those related to communication means (Chapter 3). The B to B brand (Chapter 4) can exclusively address client (Chapter 5) or be integrated in the professional client's offer meant for the final consumer in accordance with a BtoBtoC logic (Chapter 6). It can be inserted in more complex transactions with local collectivities addressing citizen-users on the BtoAtoU mode (Chapter 7). It can also be part of a relationship with the client company and its associates in a BtoBtoE approach (Chapter 8). Finally, many « mixed » brands can be classified in both B to C and B to B categories (Chapter 9). 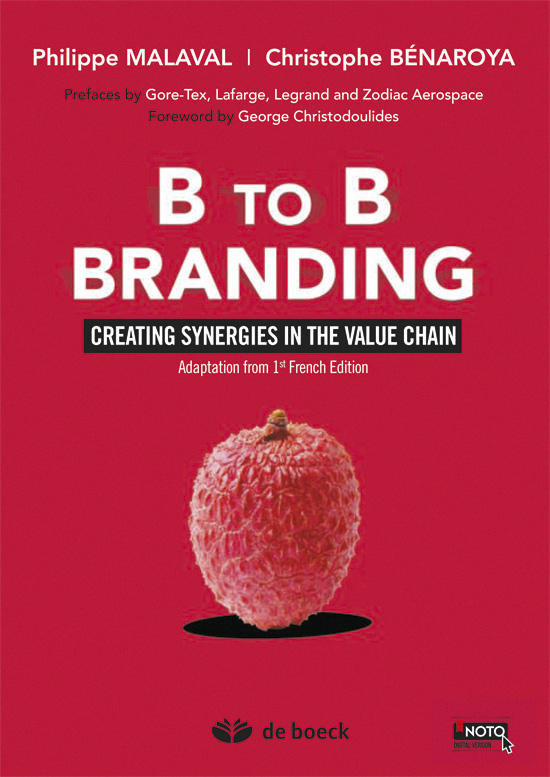 Developing an efficient B to B brand strategy boils down to controlling it entirely, from co-branding to by-products management, depending on the final targets (Chapter 10). Aside from functional recommendations, this book contains many examples illustrating these diverse BtoB approaches. Companies such as Atos, Sperian, BVA, JC Decaux, Dupont Protection, Tyvek, Airbus, Thales, Altran, Essilor-Varilux, Gore-Tex, PWC, Sodexo, Kimberly-Clark, Acova, Air Liquide, Tetra Pak, Serflex, Elis, Intel, Latécoère, Nomen, Technal, Tekelec, Veolia, Valeo, Vinci, Eiffage, Legrand, Lycra, 3M, Adobe, Adecco, Arkema portray the notions and techniques developed. By contacting in priority current strategic executives (CEO, Marketing & Business Development Director, Brand Manager) and future strategic executives (MBA executive programs), this book provides useful practical tools to teachers and university/business and management school/engineering school students who wish to master brand policy in the BtoB context. Christophe Bénaroya, graduated from Toulouse Business School, PhD in Management Science, is Professor of Marketing, after several years in the corporate field. He is in charge of the Marketing Management and Communication Paster, and the B2B Programme. Consultant for several indusrial companies, he is notably the co-author with Philippe Malaval of Aerospace Marketing Management and BtoB Brands, and the co-author of Sales Efficiency in BtoB. Philippe Malaval, graduated from Toulouse Business School, Doctor in management and habilitated to supervise research, is Professor of marketing and sales, in charge of several Master Programmes and MBAs or DBAs. He is also teaching in Engineering Schools. Experienced from the Industrial field, he founded and manages Business Conseil. Specialised in BtoB marketing, he is the author or co-author of several books from Strategy and Management of Industrial brands (published in Usa), BtoB brands and Aeropsace Marketing Management with Christophe Bénaroya (published in USA, Italy, China). He also is the author of Pentacom with Jean-Marc Décaudin.